er, Hello. And Help! | carpe diem! I’ve been reading and enjoying a lot of other blogs recently. Blogs are a bit like newsgroups, or swimming, in that you have to try it to know if you’ll like it. I like newsgroups, I’ve decided I like blogs, and I don’t like swimming. Perhaps one day I’ll feel brave enough to explain what I think is the reason I don’t like swimming, but at the moment I have a different problem. Allow me to tell you about it (and ask for advice), then I’ll be able to relax and say something more interesting than “aaaaargh”. 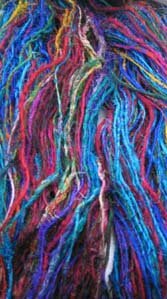 I bought some sari silk from mintfabricsin on eBay. A lot of four skeins, three pink/orange (not my favourite combination) and one worth all the rest and more beside. Blues, purples, turquoise, shot with gold and yellow. The photo doesn’t do it justice. Anyway, I wanted to have *that* skein in my stash for a possible weaving project that I don’t know enough to plan yet (I won’t collect my loom until the end of my course on the 19th). The other three are, well, spare, so I thought I’d try actually knitting the stuff, or crocheting it, or something, just to see what it does. But they all smell a bit musty, like a goat’s-milk cheese I ate once and hated. So I thought I’ll handwash it, rinse it in lavender water and hang it weighted to dry and see, well, smell if that helps. I don’t want to play with something that smells like that cheese. I washed it gently, rinsed it… and aaaargh. Many of the threads have relaxed in the water (they must like swimming) and twisted back on themselves. It wasn’t a tidy skein to begin with, and some of the threads are currently as taut as bowstrings while others are limp. I could spend ages trying to tidy, untangle and stretch threads as it hangs wet, but I’d really rather not if the problem is likely to correct itself when I wind it into a ball after it dries. What do you think? I think I need to find time to refresh my memories of html in order to make this more beautiful and find some way to put those images where I want them. Incidentally, look carefully at the little you can see of the rock weighting the problem. It’s a fragment of the Diabaig Formation of the Torridonian Sandstone in northwest Scotland. You might just be able to see that the top is slightly hollowed; that’s a fossilised ripple formed about a billion years ago. Normally I keep it beside my monitor, a reminder that whatever the problem, it’s unlikely to survive a billion years!